H Marshall Amplification σε συνεργασία με την Alfa Romeo παρουσιάζουν την Alfa Romeo MiTo By Marshall Concept, μια MiΤο με ηχοσύστημα της Marshall. Φορά ενισχυτή Marshall JVM205H 50w amp και δύο 12″ 75 watts ηχεία, τα οποία τροφοδοτούνται από μια εξωτερική μπαταρία. Εξωτερικά υπάρχει χρυσαφί γρίλια, χρυσαφί φωτιστικά σώματα, χρυσαφί χειρολαβές και χρυσαφί διακοσμητικά, με τις αλλαγές να ολοκληρώνονται με τις ζάντες 18″ και τα ειδικά σηματάκια. Στο εσωτερικό συναντάμε χρυσαφί διακοσμητικά, χρυσαφί χειρολαβές με τον 1.600αρη diesel κινητήρα να παράγει 120 άλογα. Η Marshall λέει πως το πρωτότυπο ίσως γεννήσει μια ειδική έκδοση της MiTo στο μέλλον. 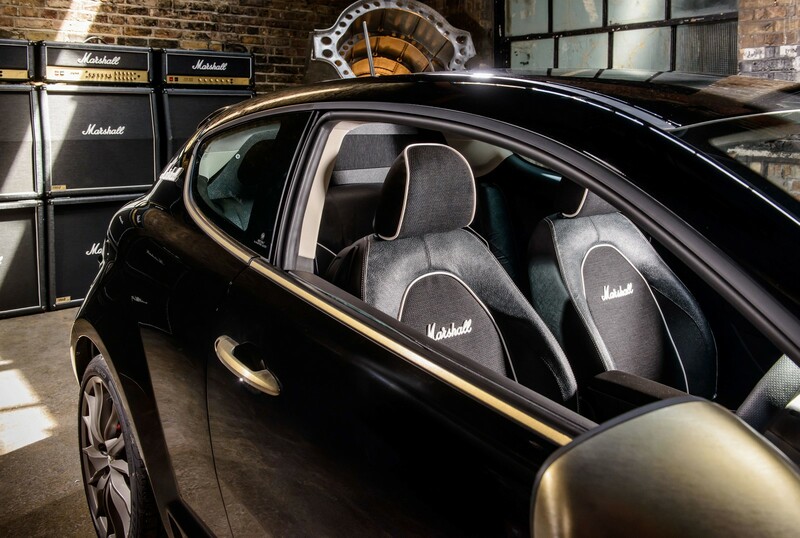 Alfa Romeo has collaborated with legendary music brand Marshall Amplification, one of the most recognisable names in guitar amps for more than 50 years, to create a one-off Alfa MiTo By Marshall concept car. The unique Alfa MiTo By Marshall draws inspiration from the look and feel of Marshall’s iconic amplifier equipment and even features a powerful, custom-fitted Marshall JVM 50w amp head running two 12 inch 75w speakers installed in the boot space. The amplifier and speaker array is powered by a dedicated battery system. Guitar heroes simply need to open the boot, plug in a guitar and crank up the power. The model will be given its public debut at a special invitation-only screening of Dave Grohl’s Sound City documentary at Olympic Studios on 24 June featuring a live performance by Tim Burgess and Mark Collins of The Charlatans. It will then be exhibited at a series of automotive and music events through the rest of 2014. Externally, the Alfa MiTo By Marshall features the iconic gold panel finish of Marshall’s equipment on the grille, front and rear headlight surrounds, door mirror covers, door handles, side door trim and lower bumper trim. Marshall badges on each rear pillar, Jim Marshall OBE’s signature above the side indicators and a #LIVEFORMUSIC graphic – Marshall’s strapline – on the rear windscreen, complete the car’s visual identity. Inside, the Marshall styling continues with Marshall tread plates on the door sills, Marshall’s distinctive white piping around the dashboard’s centre console and the iconic gold panel finish on the Alfa D.N.A. Selector surround, as well as switch-gear for the air-conditioning and climate control. A further nod to the heritage of music production, the gear knob has been replaced by a classic Shure SH55 microphone, with the gear layout engraved into the top of the head. Both front and rear seats have been specially upholstered with the same materials used on Marshall’s amplifiers, including grille cloth on the seat centres and white piping around the inner seat contours. Close-matching leather on the seat sides and backs echoes the full grain texture of Marshall’s signature cabs. Marshall logos are also placed central to each front seat. 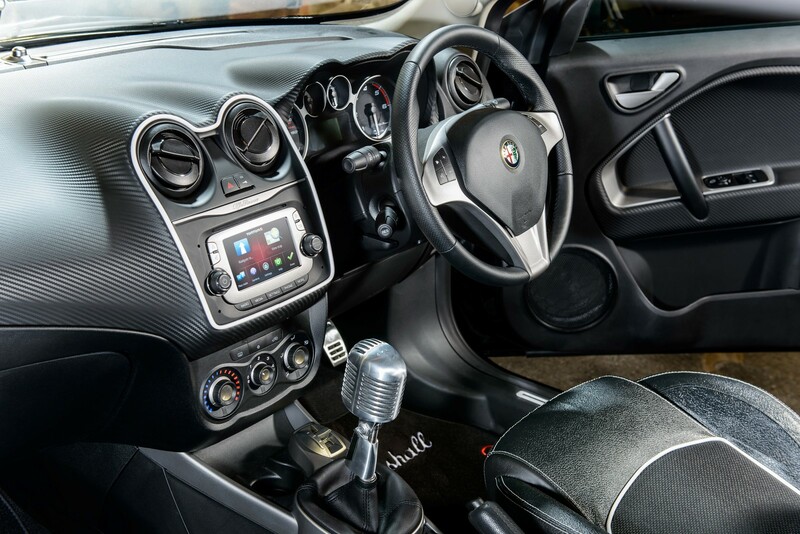 A set of co-branded Alfa MiTo and Marshall floor mats complete the interior finish. The British-built, all-valve 50 Watt JVM205H installed in the Alfa MiTo By Marshall delivers a straightforward two channel preamp: clean/crunch and overdrive. The two independent channels both have three modes, each mode reconfiguring the gain structure of each channel, making six modes in total. This means the JVM205H is tonally very versatile. Equipped with ground-breaking technology, the JVM205H features two studio quality digital reverbs (one per channel), with individual channel EQ, two master volumes, and Stompware® foot switchable memory that will recall reverb, FX loop and master settings. The Alfa MiTo By Marshall concept is based on the Alfa MiTo Distinctive MY’14 version and powered by the punchy 1.6 JTDM-2 120bhp engine. Alfa Romeo touches include 18 inch alloy wheels, red brake calipers, aluminium sports pedals and chrome exhaust pipes. The Uconnect™ 5 inch colour touch screen infotainment system also features Bluetooth® and voice recognition with USB and Aux-in inputs for listening to music on the move. 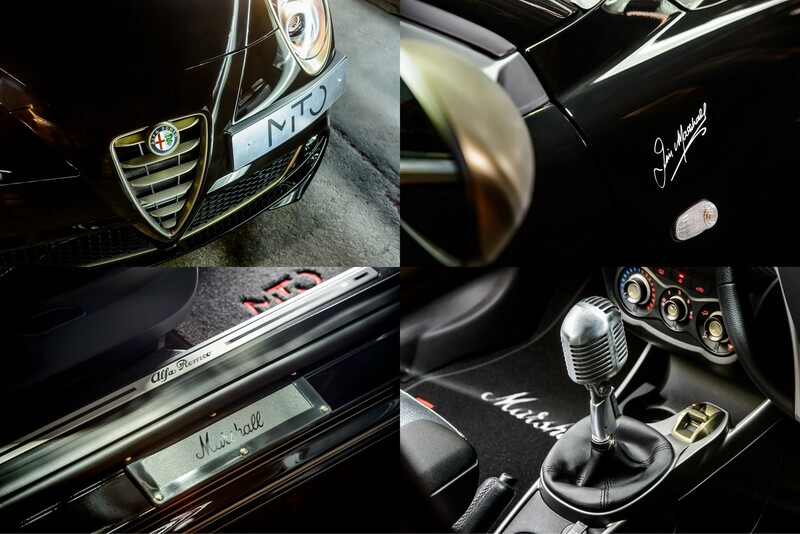 Ivan Gibson, Head of brand for Alfa Romeo, said, “The Alfa MiTo By Marshall is the realisation of a fantastic project between two iconic brands from the worlds of automotive and music. We’re very excited by the way this collaboration has come together with the opportunity to work side by side with one of the most recognisable and respected music brands in the world.